We’d love your help. 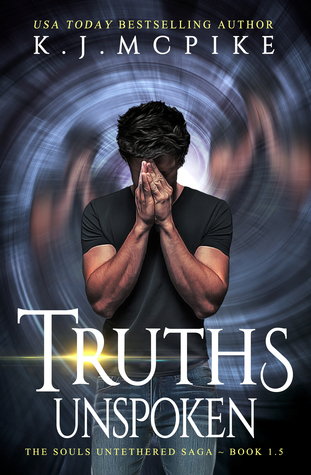 Let us know what’s wrong with this preview of Truths Unspoken by K.J. McPike. To ask other readers questions about Truths Unspoken, please sign up. This one was a tough one for me. I absolutely loved XODUS. It's told from Lali's pov and she's such a great character. This is from Kai's and no matter how hard I try, I can't bring myself to like him. It's not only his actions and his lies, but he comes across as grumpy and judgmental. It's not attractive. But his story is heartbreaking. This book is him telling Lali what drove him to do everything he'd done. The chapters are separated by segments of a letter he's writing to her that is so full This one was a tough one for me. I absolutely loved XODUS. It's told from Lali's pov and she's such a great character. This is from Kai's and no matter how hard I try, I can't bring myself to like him. It's not only his actions and his lies, but he comes across as grumpy and judgmental. It's not attractive. But his story is heartbreaking. This book is him telling Lali what drove him to do everything he'd done. The chapters are separated by segments of a letter he's writing to her that is so full of emotion, I stopped caring whether I liked him or not. I even started wanting her to forgive him. It was an interesting experience - this rooting for someone who seem irredeemable. I couldn't stop reading. It's hard to comprehend how good the writing is in this book. To create such conflict in me. I don't know if I liked this book, but at the same time I know it was perfect. I've never read something quite like that. It makes the review super hard. On one hand I want to give it 10 out of 5 stars. On the other, I'm not sure. The most fascinating character in XODUS was definitely Kai Awana, the mercurial teenage boy with the (clearly) hidden agenda that shows up out of nowhere to help the heroine, Lali, locate her missing mother. Kai's motivation for helping Lali, once the climax of that story was reached, were a lot more complex than Ms. McPike let us realize. In Nemesis, we get the events of XODUS - before, during, and just after - from Kai's perspective. While a lot of the scenes, conversations and events were not The most fascinating character in XODUS was definitely Kai Awana, the mercurial teenage boy with the (clearly) hidden agenda that shows up out of nowhere to help the heroine, Lali, locate her missing mother. Kai's motivation for helping Lali, once the climax of that story was reached, were a lot more complex than Ms. McPike let us realize. In Nemesis, we get the events of XODUS - before, during, and just after - from Kai's perspective. While a lot of the scenes, conversations and events were not as fresh the second time around, it was interesting getting said events from the opposite perspective. Needless to say, Kai is a complicated cat. I must say, I love Kelly McPike's writing style. It flows well, and I was just as entertained by Nemesis as I was by its predecessor. And now I can only wonder where the series goes from here ... because it sure ain't over yet! I enjoyed reading the first book in the series which was one of the finest books that I've read. It was great reading the book from Kai's point of view and looking at the things from a different perception. There was great turn over of events and by the time Kai decided to clear it all up, the things had gotten messier. It was good knowing what had gotten Kai to do the kidnapping and how the circumstances had been for him. At the end of the book there a great twist which left me facinated. These are exceptional names which I've never come across before. I didn't need to worry about how to pronounce these names as the author had already taken care of it by giving an instruction manual of how to pronounce these words in the beginning itself. I was already excited for the next book after reading Xodus and this book has made me all the more anxious. I'm waiting in anticipation for the next book to come up. Nemesis, the followup companion novel to K.J. McPike's award-winning debut paranormal thriller, XODUS, stands on its own as an entertaining, action-packed, and well-written addition to the Astralis series. As with any great conflict, there are two sides to every story. Told from Kai Awana's perspective, Nemesis offers an alternative narrative to the events that transpired in XODUS. Through his eyes, we are able to delve into Kai's intricate past, his internal conflicts with his own identity, and Nemesis, the followup companion novel to K.J. McPike's award-winning debut paranormal thriller, XODUS, stands on its own as an entertaining, action-packed, and well-written addition to the Astralis series. As with any great conflict, there are two sides to every story. Told from Kai Awana's perspective, Nemesis offers an alternative narrative to the events that transpired in XODUS. Through his eyes, we are able to delve into Kai's intricate past, his internal conflicts with his own identity, and his complex relationships with XODUS' protagonist, Lali Yavari, and (surprisingly) XODUS' main antagonist, Cade. With Kai's personality as its main star, Nemesis shines with quick-witted remarks and laugh-out-loud punchlines speckled throughout its pages. A must-read for every Astralis fan, K.J. McPike's Nemesis is a treasure trove of new information about the past and future of the Astralis universe (i.e. filling fans in on what really happened to Lali's mother, Xiomara, during those first few months and the rise of a NEW and SHOCKING "big bad"), and serves as a deeply personal case study of what it means to be truly human, a constant struggle with one's own morals and conscience. Hmm, what can I say about Nemesis (Astralis #1.5)…how about it’s awesome. Though it’s set during and just after the events of Xodus I did not feel it was repetitive because this time around it’s told trough Kai’s perspective and allows for the reader to get a deeper understanding of his character. With K.J. McPike’s superb storytelling skills, I was once again sucked right into the story from the very first page. Being inside Kai’s head was great and made me love his character even more. He was e Hmm, what can I say about Nemesis (Astralis #1.5)…how about it’s awesome. Though it’s set during and just after the events of Xodus I did not feel it was repetitive because this time around it’s told trough Kai’s perspective and allows for the reader to get a deeper understanding of his character. With K.J. McPike’s superb storytelling skills, I was once again sucked right into the story from the very first page. Being inside Kai’s head was great and made me love his character even more. He was easily relatable and I completely understood and sympathized with him on the things he had to do because he truly believed it was the only choice he had in getting his sister back. He struggled with the rights and the wrongs and that added to the likability of his character. He was doing villainous things, but he wasn’t a villain. Reading Nemesis, greatly added to the story world K.J. McPike has created and I highly recommend it to everyone who enjoyed Xodus. This novel is a masterpiece! I was roped in and kept on the edge of my seat the entire time! Kai, the main character, is intricately woven so that he has incredible depth; his internal as well as external conflicts distinguish him from the majority of individuals, especially in how he manages to deal with every issue that arises in his life. Simultaneously, McPike manages to have every other character have their own unique traits. There is never a point in the book where a character becomes dull This novel is a masterpiece! I was roped in and kept on the edge of my seat the entire time! Kai, the main character, is intricately woven so that he has incredible depth; his internal as well as external conflicts distinguish him from the majority of individuals, especially in how he manages to deal with every issue that arises in his life. Simultaneously, McPike manages to have every other character have their own unique traits. There is never a point in the book where a character becomes dull and there is always advancement of the plot. This series is exciting and terrifying. How far would you go to save someone you love? In this series two teens have to figure that out. This series is a must have for YA fans of all ages. Last year I read K.J. McPike’s XODUS and it quickly made it to my top 5 reads of 2015. I loved everything about the book and the characters and was desperate to read more of their story. But I especially wanted to know more about Kai. I couldn’t wait to hear his side of the story so I jumped at the chance to read McPike’s latest Astralis novel, Nemesis. Nemesis gives us the events before, during and after XODUS from Kai’s point of view. The story flows just as well as the first and despite includ Last year I read K.J. McPike’s XODUS and it quickly made it to my top 5 reads of 2015. I loved everything about the book and the characters and was desperate to read more of their story. But I especially wanted to know more about Kai. I couldn’t wait to hear his side of the story so I jumped at the chance to read McPike’s latest Astralis novel, Nemesis. Nemesis gives us the events before, during and after XODUS from Kai’s point of view. The story flows just as well as the first and despite including the same conversations and events, the depth and complexity of Kai’s character meant the story never felt repetitive. In fact, it was heartbreaking. Fueled by emotions and internal moral conflict, Kai was driven to do terrible things for the people he cares about the most. This story shows he’s not a villain, he’s simply human. Nemesis added so much to depth to the world of the Astralis series and I am so excited to see where the series goes next!